President Clements with Sheila and Waenard Miller, M.D. 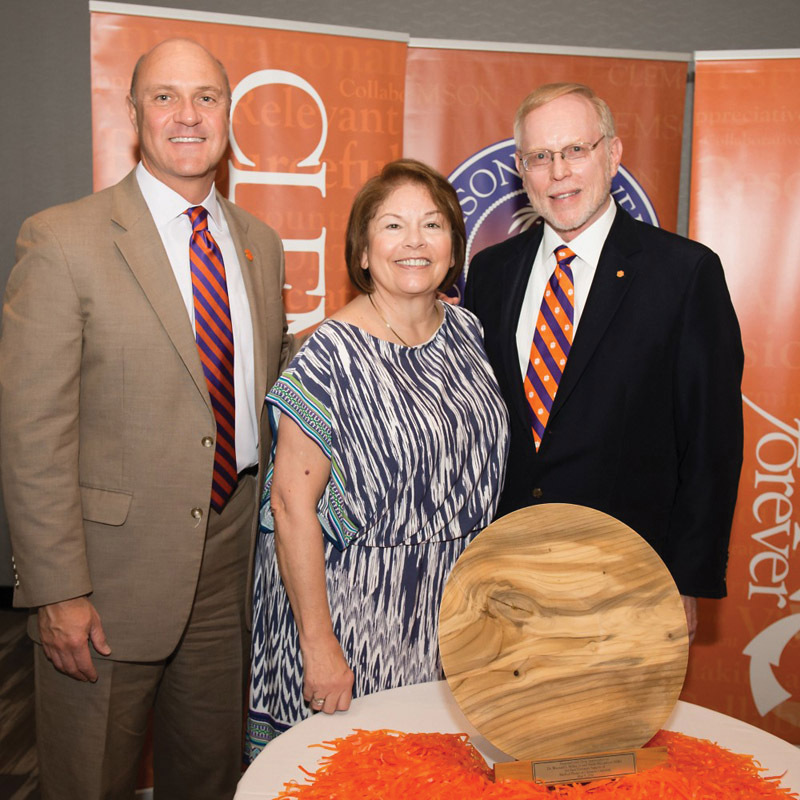 The Millers received a platter crafted of wood from a tree that once stood on Clemson’s campus. Cardiologist Waenard L. Miller ’69 has spent his career on the cutting edge of medicine, raising the level of care for patients higher and higher. Now the gift that he and his wife, Sheila, of Frisco, Texas, have given will ensure that future Clemson graduates can do the same. The two have donated $2 million to Clemson to establish the Dr. Waenard L. Miller, Jr. ’69 and Sheila M. Miller Endowed Chair in Medical Physics. “My vision of the medical physics program is a multidisciplinary collaborative endeavor associated with excellence in research, exponential growth in innovation and outstanding educational opportunities for students,” Miller said. Miller earned his physics degree from Clemson in 1969. He received his medical degree from the Medical University of South Carolina and completed his internal medicine residency and a fellowship in cardiology at the University of Texas Southwestern Medical School. He also holds master’s degrees in nuclear physics, biology and medical management. The Millers met when they were in high school in Greenville. Sheila’s father, Bernyrd C. McLawhorn, was a Greenville physician with degrees in physics and medicine. Sheila fondly remembers the friendship between her father and her future husband. “When I was dating Waenard, I knew I had to get to the door immediately, because if I didn’t get there right away, the two of them would go off in a corner and start talking about black holes, and we’d be late for wherever we were going,” she said. Miller, in Air Force ROTC at Clemson, was commissioned as a second lieutenant upon graduation and sent to graduate school in nuclear physics. He then served at Wright-Patterson Air Force Base in the foreign technology division as a physicist and later transferred to the Aerospace Medical Research Laboratory. There he became intrigued with the combined concept of physics and biology. Miller began practicing medicine near Dallas in 1983 and co-founded the Legacy Heart Center (LHC) in 1995. Under his leadership, LHC became renowned for leading-edge cardiovascular care. Texas Monthly magazine named him a “Texas Super Doctor” for eight consecutive years. President Clements described Miller as one of the University’s most accomplished alumni. The endowed position will be a joint appointment in Clemson’s departments of physics and astronomy and bioengineering. While collaborating with medical partners of Clemson University, the research conducted by the endowed chair holder will be at the interface of science and engineering with clinical translation as the outcome. The Millers’ gift is a part of the successful $1 billion Will to Lead for Clemson campaign.